← LINDA SIMON. Falling enrolments in TAFE! How can this be? Children of migrant families in Australia consistently outperform their more established peers at school. And new analysis using NAPLAN data shows schools with lots of migrant-background students not only achieve at higher levels, but they have higher growth over time on average too. Australia is one of the few countries in the world where students of migrant families (i.e. kids who are born in Australia but have parents born overseas) achieve at significantly higher levels than non-immigrant students, according to the OECD’s international problem-solving test for 15-year-olds, the Program for International Student Assessment (PISA). New Grattan Institute analysis goes further to compare the rates of student growth as students move through schooling over time, rather than achievement at a point in time. 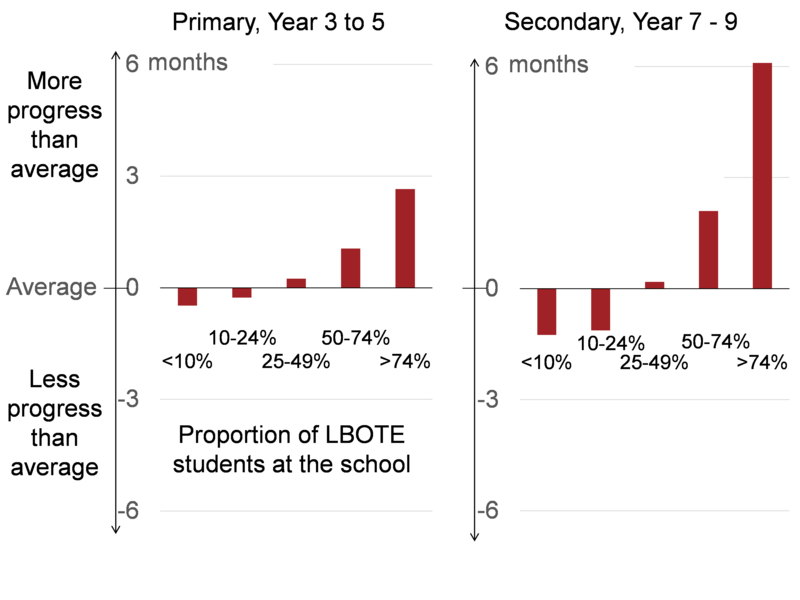 Our analysis uses NAPLAN data to compare the growth of schools with different proportions of students with language backgrounds other than English (LBOTE), many who have probably come from families who have migrated to Australia in recent decades. Our findings are striking. Schools with lots of students with a language background other than English make much more rapid learning growth on average, especially in numeracy. Chart 1 shows how much progress students make in NAPLAN numeracy between Year 3 and Year 5, depending on the demographics of their school. Students at ‘migrant rich’ schools (where more than three quarters of the children have a language background other than English) make around 3 months more growth than students at schools with few migrants (where less than 10 per cent of students are classified as LBOTE). The gap is even bigger in secondary school: students at migrant-rich schools make 7 months more growth in numeracy results between Year 7 and Year 9. In reading, children with a language background other than English make slightly slower progress at primary school. But in secondary school, this trend is reversed: migrant-background students’ learning growth outstrips their native peers by around 6 months between Year 7 and Year 9. 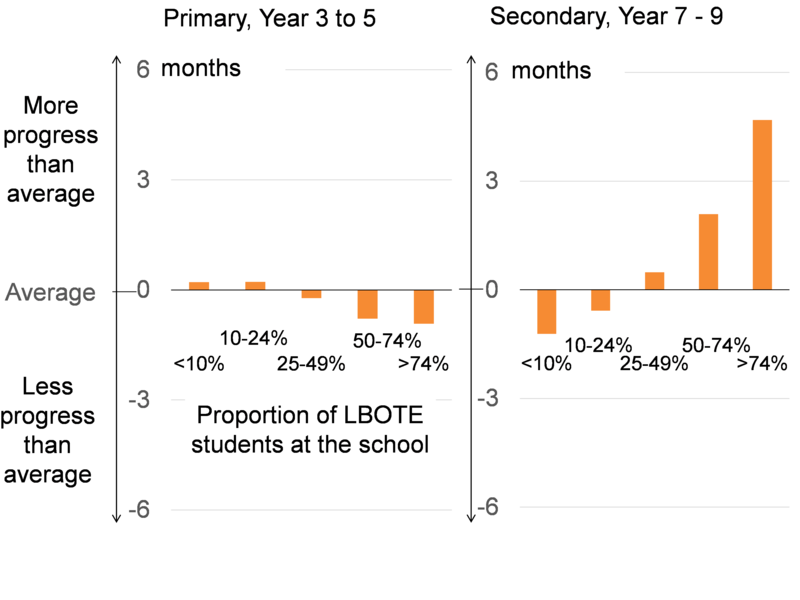 Our analysis compares rates of growth in schools on a like-for-like basis, so that the influence of socio-economic characteristics are taken into account (lower socio-economic status (SES) typically make slower learning progress than higher-SES students). The LBOTE group also includes a small proportion, roughly 11 per cent, of students who speak Indigenous languages at home, whose results are typically much worse than the overall average but not able to be seen here. * ‘Months of progress’ is calculated using school-level mean NAPLAN scores for matched student cohorts, including nation-wide data but excluding QLD, SA & WA at secondary level. **ICSEA stands for Index of Community Socio-Educational Advantage. Excludes schools at extreme ends outside of ICSEA between 875 and 1124. Sources: ACARA, Grattan Institute analysis. There are several possible explanations for this counter-intuitive phenomenon that migrant kids do better than non-immigrant kids at school. One likely reason is that migrant students are pushed harder by parents who had sufficient drive and ambition to seek opportunities in a new country. Many may have made family decisions to emigrate ‘so the children could find a better life’. Children in this situation might be more motivated to study hard and learn more. Another explanation could be that migrant students are more likely to receive out-of-school tutoring and focus more on homework. Or they simply better prepare for the NAPLAN tests. Although these reasons cannot entirely explain why migrant students in Australia perform better on international PISA tests which assess real-world problem-solving skills, a test that is harder to ‘game’ or prepare for in advance compared to NAPLAN. Alternatively it could be that the cognitive benefits of learning an additional language help boost LBOTE students’ performance more generally compared to their monolingual peers. It’s also possible that the higher rates of average performance at migrant-rich schools are partially coming from improvements in the non-migrant students sitting in those classrooms. The ‘peer effect’ has been shown to be a big influence on student performance, so a school where hard-studying migrant students set the culture might be expected to do better overall. OECD evidence shows non-migrant students tend to perform better in the collaboration aspects of assessment when they attend schools with a larger proportion of immigrant students. In addition, teachers may find migrant-rich classrooms are better behaved and easier to engage in learning, and can simply do their jobs better. Similarly, there could be many reasons why migrant kids do better than non-immigrant kids at school in Australia compared to other countries, for example the US and UK. This finding holds true after accounting for student family background and socio-economic status. One explanation could be the type of migrant families settling in Australia, given our highly skilled migration program. Given our more selective visa intake, our migrant students may have stronger baseline academic proficiency compared to migrant students settling elsewhere. Or it could be that Australia is better in re-settling migrants and helping them settling into school, through better targeted support programs, better access to general health and social services, or simply a more welcoming school environment. These findings on migrant students are important given that Australia’s school education results are stagnating. We should look at students of migrant families, and migrant-rich schools, and learn the lessons. *Grattan Institute’s new analysis will be published later this year. Julie is a Fellow at the Grattan Institute. She is an economist with significant experience in school education policy and system design, and has co-authored several high profile reports on effective teaching, professional learning, equity and funding. This entry was posted in Education, Refugees, Immigration. Bookmark the permalink. How can ALP develop an appropriate Refugee Policy? Any boat people arriving will be sent back to a Refugee camp run by UN by plane and Australia will take the same number of refugees as sent back to UN refugee camp and those that did come to Australia are not allowed back to Australia as refugees. There are gaps in my knowledge . Some say there are no refugee queues- yet the Government says you have to be on the queues. As a former Immigration HOD can you give guidance or refer me to other to move forward. if ALP develops any policy that allows Boats the current Government will eat them alive with Dutton and his cohorts.